What does eco-tourism and being sustainable really mean? Is that just recycling the trash or turning off a few lights? 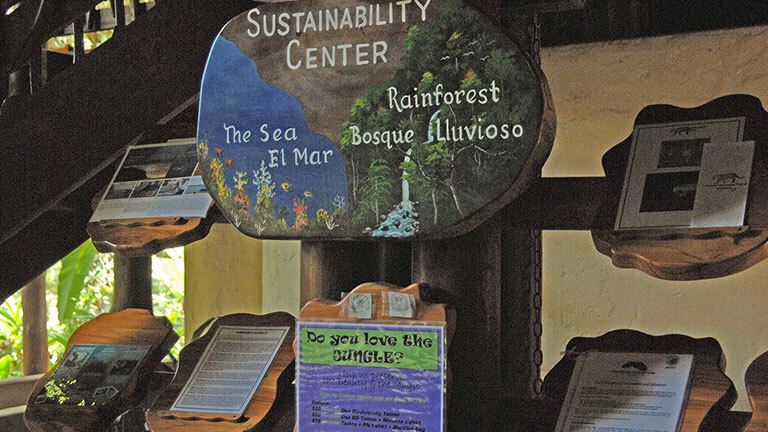 At Playa Nicuesa Rainforest Lodge in Costa Rica, sustainability means much more. The Costa Rica rainforest lodge is one of only three dozen hotels in Costa Rica that have received the highest rating of Five Leaves in the Certification for Sustainable Tourism Program (CST). Created by the Costa Rican Tourism Board (ICT), the CST program rates and certifies tourism businesses based on their compliance with natural, cultural and social resource management. CST consists of five levels, called "Leaves", Level five, or Five Leaves, signifies that the company is considered â€œoutstanding in terms of sustainability." "Our goal is to provide guests with an experience that they will always remember fondly: Excellence, friendly service, high-end accommodations, educational opportunities and unique, well-run adventure activities, and to provide this experience while operating the lodge in the most environmentally-friendly manner possible," explained Playa Nicuesa owners, Michael and Donna Butler. The extraordinary Costa Rica eco-lodge was designed in harmony with the environment constructed from naturally fallen trees and recycled materials. Immersed in the dense tropical rainforest bordering the Piedras Blancas National Park and the pristine Golfo Dulce (Sweet Gulf) in southern Costa Rica, Playa Nicuesa Rainforest Lodge is located on a 165-acre private preserve. Adding to its uniqueness, the only way to get there is by boat across the pristine waters of the Golfo Dulce from either Golfito or Puerto Jimenez. "We traveled all over Costa Rica and other parts of Central America to find and create a special place where one can intimately experience the natural world of both the tropical rainforest and the Pacific Ocean,â€ expounded the Costa Rica rainforest lodge owners. â€œOur plan was to create a place that offers the comfort of a lodge and the activities and diversity of an adventure tour." The area is part of a giant conservation area including the world-famous Corcovado National Park on the Osa Peninsula. The unique tropical fjord of Golfo Dulce is a critical habitat for migrating Pacific Humpback Whales, and resident and migratory communities of dolphins and sea turtles. Check out Playa Nicuesa Rainforest Lodge â€œGreen Season Specialsâ€ for adventure, nature, yoga, relaxation and comfort at great prices through Sept. 30, 2014.